Blade or shoulder chops come from the spine, and tend to contain large amounts of connective tissue. The sirloin chop is taken from the (rear) leg end and also contains a large amount of connective tissue. The so-called "Iowa Chop" is a thick center cut; the term was coined in 1976 by the Iowa Pork Producers Association. A "Bacon Chop" is cut from the shoulder end and leaves the pork belly meat attached. Pork chops are sometimes sold marinated to add flavour; marinades such as a chilli sauce or a barbecue sauce are common. As pork is often cooked more thoroughly than beef, thus running the risk of drying out the meat, pork chops can be brined to maintain moistness. Pork chops are suitable for roasting, grilling, or frying, but there are also recipes of stuffed pork chops. They can be used boneless or bone-in. There is a belief that bone-in chops taste better because bones make the meat juicier by retaining the moisture inside. Pork chops are usually cut between 1/2 inch and 2 inches thick. Click here to read the Hidden Valley story. In small bowl, add seasoning mix. Season both side of pork chops with salt, pepper, garlic powder and onion powder. Dredge pork chops in seasoning mix. Place pork chops on lightly greased baking sheet. Bake pork chops for 20 minutes, turning once, until browned or internal temperature of 160 degrees F is reached. Enjoy! What a terrific, easy recipe for the weekend! 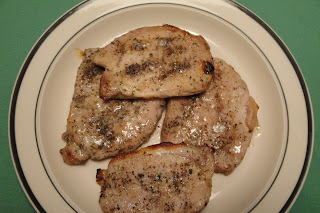 I just made baked chicken with simple and easy dressing like you.I am sure pork chops tasted great as they look. Have a nice weekend! It's simple, quick and delicious. I like to use seasoning mix to prepare the chicken and fish too. Ranch dressing is so versatile, however, I never thought about using it on pork. Wish I had this recipe earlier, for we had chops last night. Yours were probably more flavorful. Enjoy the weekend! 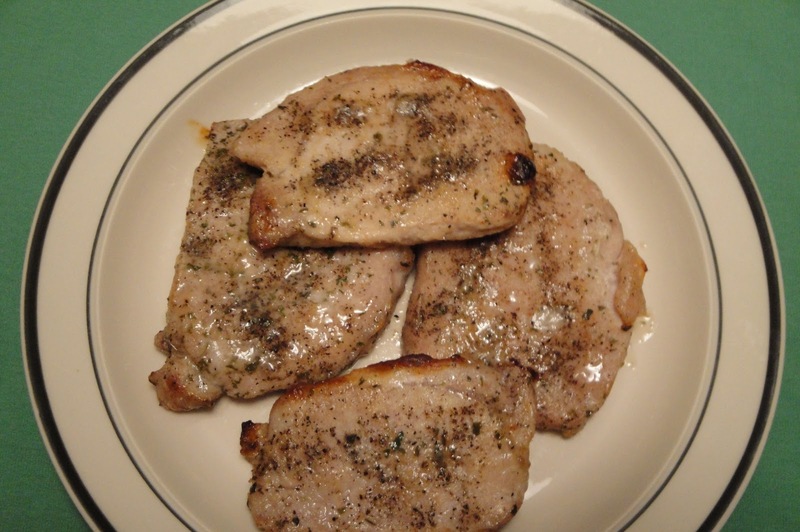 I love pork chops, they are really healthy and the combination sounds wonderful! What a great idea, Christine! Pork chops are my hubby's favorite -- will have to surprise him with this yummy flavor combo. :) Thanks for explaining the different cuts, too! Oh yes, nice and easy and juicy to the bone! quick-delish-juicy, great for the weekend! I miss a good prok chop. I used to marinate them and throw then on the grill. I love the simplicy of your recipe! Hope you have a great weekend! I have all the ingredients in my pantry. I may have to try these this weekend. Thanks for sharing. You should post it. I can't wait to see your dish. mmmm sounds good, and easy enough!! You could put ranch on a piece of cardboard and I would eat it. That said, these look delicious ma'am. Keep up the good work. I grew up in Iowa so I am groomed to love the pork chop. Everything on TV was "Pork: The other white meat" These look yummy!